WORDSONTHEPAGEATHON is back! I officially invite you to join me in this 24 hour writing challenge. Put the entire day aside for writing and getting your words on the page. Make sure you mark your calendars for this November 3rd! I want to invite writers (from newbies to experts) to accompany me on this 24 hour writeathon. The first Saturday of November is a day of writing! As someone working on several stories, I want to spend all my time writing. But that is not always possible. Instead, I am pledging to write for 24 hours the first Saturday of the month *every* month. Inspired by Dewey’s 24 hour readathon, I hope fellow writers will join me in this quest. I’d love to have some company on this writing journey. 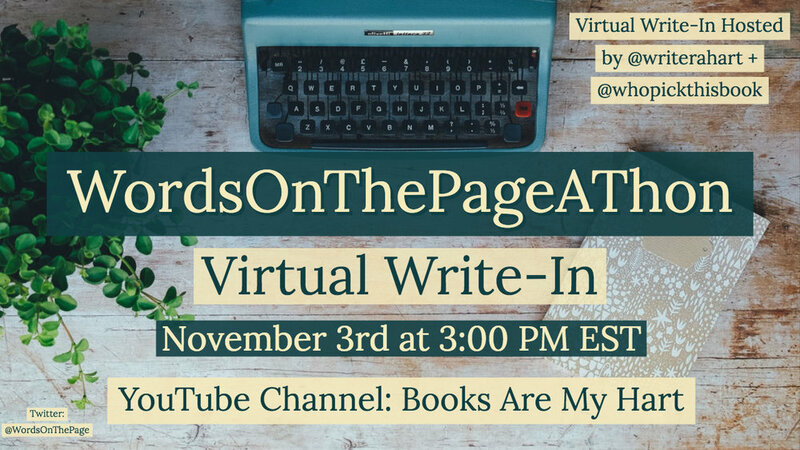 To help you get writing, Nicole (aka Who Picked This Book) and myself will be holding a virtual write-in at 3 PM EST. For additional information, be sure to follow the WordsOnThePage Blog, Twitter, and Instagram.